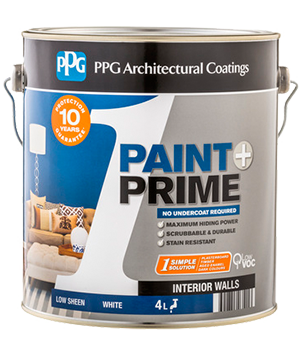 PPG Architectural Coatings 1 Paint + Prime is a combined, 1-step paint & prime solution with a durable finish and maximum hiding power, eliminating the need for an undercoat. Surfaces must be clean, dry and free from all surface contamination and dust. Treat mould with bleach then rinse with clean water. Fill in the surface defects with suitable filler or sealant. Avoid using masking tape on wall and ceiling paints. Sand plasterboard joins to obtain a smooth uniform surface. Remove all loose and flaking paint and ensure the surface is clean and dry. Lightly sand glossy or enamel surfaces. Confirm colour before use. Apply two coats by roller or brush. Paint the corners and edges with a narrow brush and roll up to the edges using a 10–12mm (length of nap or pile) roller. Up to 16 square metres per litre. Coverage will be lower on rough or absorbent surfaces. Ensure adequate ventilation, keep floors and furniture covered. Keep the lid on containers when not in use. Scrape excess paint from equipment back into the original container. Wash up with water. Do not dispose of paint or wash water in drains or sewers. Avoid exposure to steam for 48 hours. Surface may be washed after 7 days but always avoid abrasive cleaners.